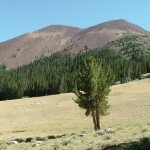 A view of Davis Mountain’s east face from Skull Valley. Editor’s note: This is another installment in a multi-part series on exploring the Pony Express Trail through Tooele County. In last week’s article, we made our way out of the Onaqui Mountains and down into Skull Valley along the Pony Express Trail. As you head west and across Skull Valley, an interesting pyramid-shaped mountain comes into view. 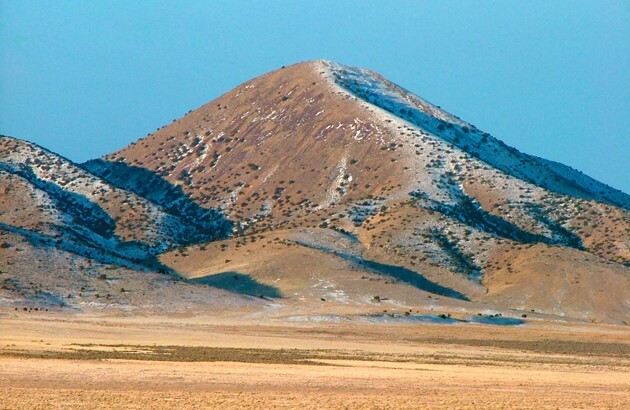 It is known as Davis Mountain and its high point — the pyramid that rises to an elevation of 6,434 feet above sea level — is identified as Round Top on USGS maps. The mountain is named after David E. “Peg Leg” Davis, a tough frontiersman and character straight out of the Old West Desert of Utah. Ever since I laid eyes on Davis Mountain, I wondered about the man named Peg Leg. One of the great things about Tooele County is that many of the pioneer families who settled the area have descendants who still live here. These descendants have protected old family histories, diaries and notes. Many are familiar with their incredible heritage. Years ago, I spoke with Keith Davis, who is the great grandson of Peg Leg Davis. From that visit, I learned a lot about the frontiersman. Davis got his name after losing a leg in an industrial accident in 1862. Afterward, he hobbled around on a wooden leg, but it did not slow him down. According to family histories, in April 1869, he was hired by the Western Union Company to open a telegraph office at Simpson Springs. The Davis Family history journal states that the telegraph office opened on May 2, 1869. Davis operated the office there for a few years until, for some reason in 1871, he built an office at Government Creek. According to the journals, he operated that office until 1878. In 1878, Davis moved the office to Clover and built the brick house, the first one you see on the right (north) side of the road as you enter the community of Rush Valley on state Route 199 heading west to Johnson’s Pass and Dugway. These dates of operation are mysterious because the telegraph line was completed in 1861 and it was supposedly moved north to share the route with the railroad in 1869 when the transcontinental railroad was completed. It will take more digging in the archives to make sense of it all, but the facts remain that Davis, whatever the years, did operate a lonely telegraph station in the West Desert when the area was a wild frontier. What I find interesting is that Davis was also a polygamist. According to family history documents, he married three sisters: Ann Warner Simpson (1867), Mary Emma Simpson (1870) and Sara Jane Simpson (1876). The entire family lived and worked at Government Creek and it is said that the three sisters may have been the first female telegraph operators west of the Mississippi River. On a sad note: Sara Jane’s first-born son was buried near the site of the Government Creek Telegraph Office. As I wander around the desert, I think about these people who worked hard and suffered often to make a living in this wilderness, and ultimately left loved ones behind who didn’t survive. There is no evidence on the land of their lives and accomplishments. Sagebrush, tumbleweeds, cheat grass and a jack rabbit or two, are all that’s left. One of my favorite hikes in the desert is the mountain that bear’s Peg Leg’s name — Davis Mountain Round Top. 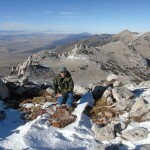 The summit is like no other: It sits in Skull Valley like an old battleship at the bottom of a long gone ancient sea. From its summit, you have a 360-degree view of Skull Valley, miles and miles of the Pony Express Trail from the Onaqui Mountains to the point of the Simpson Mountains, and the barren ranges of the West Desert that lie in hazy succession to the west. Another reason that I find Davis Mountain Round Top so attractive is that it’s a peak that receives little snow during the winter. Road permitting, it can be climbed year-round when its neighboring higher ranges are snowbound. Weather is always a concern, so you should check with the Bureau of Land Management or Tooele County for road conditions prior to venturing out on the desert. To get to Davis Mountain Round Top by the most direct route, follow state High 199 west through Rush Valley, over Johnson’s Pass and across Skull Valley to Dugway Proving Ground’s gate. Just after the LDS church on the left and before Dugway’s gate, there’s a dirt road on the left. Turn left and follow that road south for about 8 miles to the vicinity of Davis Mountain. Round Top is impossible to miss as it rises from the plain like a great pyramid of Giza to the southwest. 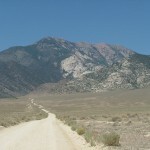 In recent years, a plague of tumble weeds has blocked some of the two-track dirt roads that get you closer to the mountain. No problem, however, because the distance from the maintained dirt road to the base of the peak is not far and actually adds a few miles to enjoy the scenery before an otherwise short hike. From whatever start point you choose, the distance to the summit is only 1 mile. The elevation gain is extreme, however, as you will gain roughly 1,334 feet in this distance. There is no trail and you will literally be route finding your way up this lonely desert cone. The abrupt elevation gain, coupled with the shape and feel of the mountain, make it an excellent training ground for ascents of higher peaks in the summertime. As you begin the climb, you will encounter the Lake Bonneville Bench. This terrace is 300 feet above the valley floor and is distinct in this area. On my numerous climbs of Round Top, I have noticed bright orange lichen on the limestone rocks. There are curious masses of moss too. On one occasion, I spooked several slumbering mule deer out of the junipers as I climbed higher. All around the base of Davis Mountain, you will have the opportunity to see some amazing wildlife. Wild horses, pronghorn antelope, mule deer, coyote, golden eagles and other large birds of prey frequent the area. Many of these creatures can be seen from the main gravel road that heads south from Dugway’s gate. If you are just looking for a good scenic drive option, this could be it. In next week’s article, we will pick up from near the summit of Davis Mountain Round Top and discuss the geology and views from that point. We will also examine the question of whether or not there was a Pony Express Station at Government Creek. We will also take a closer look at telegraph operations and finally, study the ghosts that may wander the dry lonely wash of Government Creek. 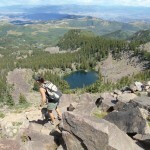 Maps: Davis Knolls and Indian Peaks 1:24,000 BLM/USGS maps.